401 Marlborough is located on the north side of Marlborough, between Hereford and Massachusetts Avenue, with 399 Marlborough to the east and 403 Marlborough to the west. 401 Marlborough was designed by Cabot and Chandler, architects, and built in 1885-1886 by George G. Shepard, mason, and Morton & Chesley, carpenters, as the home of merchant William Simes and his wife, Fannie Swett (Newell) Simes. 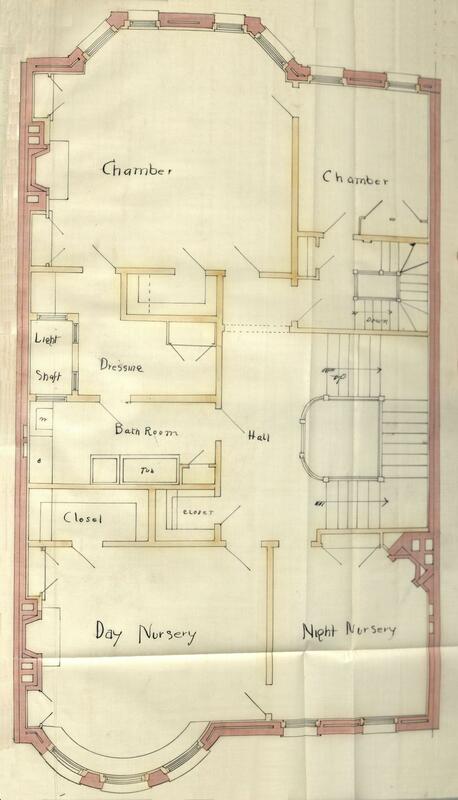 He is shown as the owner of 401 Marlborough on the original building permit application, dated August 21, 1885, and on the final building inspection report, dated December 15, 1886. William Simes purchased the land for 401 Marlborough on June 10, 1885, in two transactions, a 34 foot wide lot to the east from Anna Powell Mason (Sears) Amory, the wife of William Amory, and a 2 foot wide lot to the west from her son, William Amory, Jr. The lot he purchased from Anna Amory also previously had been owned by her son, part of a 54 foot wide lot she had acquired it from him on February 10, 1881. All of the land had been part of a parcel purchased on March 1, 1872, from the Boston Water Power Company by a real estate investment trust formed by Grenville T. W. Braman, Henry D. Hyde, and Frank W. Andrews. Click here for an index to the deeds for 401 Marlborough, and click here for further information on the land on the north side of Marlborough between Hereford and Massachusetts Avenue. By the 1886-1887 winter season, William and Fannie Simes had made 401 Marlborough their home. They previously had lived at 257 Marlborough. They continued to live at 401 Marlborough during the 1887-1888 winter season, but moved thereafter. During the 1888-1889 winter season, 401 Marlborough was the home of Mr. and Mrs. William Pratt, probably real estate broker William Pratt and his wife, Anita P. (Jones) Pratt. They had lived at 14 Hereford during the 1882-1883 season and then made their home in Manchester, Massachusetts. On August 17, 1889, 401 Marlborough was purchased from William Simes by dry goods commission merchant Daniel Denny. He and his wife, Mary DeForest (Bigelow) Denny, made it their home. They previously had lived at 8 Gloucester. They also maintained a home in Milton. Daniel Denny’s unmarried brother, Clarence Holbrook Denny, lived with them until about 1895, when he moved to 66 Beacon. He was a wool dealer. Daniel Denny died in October of 1897. 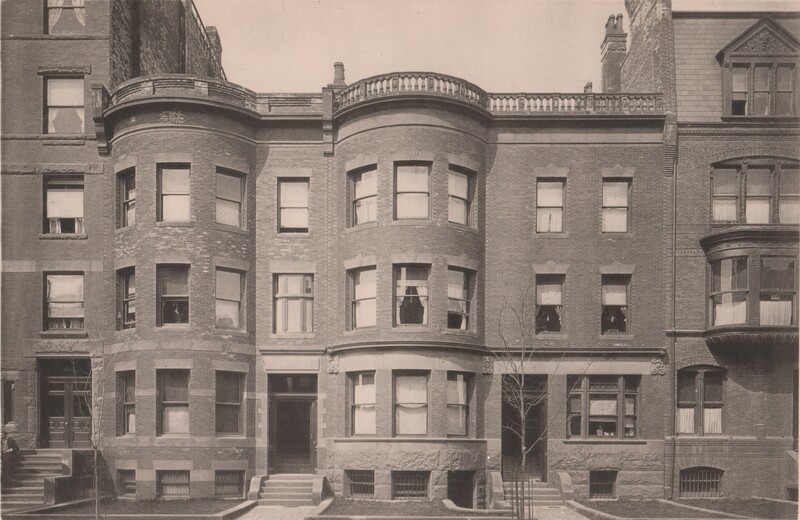 Mary Denny continued to live at 401 Marlborough during the 1897-1898 season, but moved thereafter to an apartment in The Graffam at 330 Dartmouth. Daniel Denny’s estate continued to own 401 Marlborough and lease it to others. By the 1898-1899 winter season, 401 Marlborough was the home of Moorfield Storey, an attorney, and his wife, Gertrude (Cutts) Storey. They previously had lived in Brookline. They also maintained a home in Lincoln. They continued to live at 401 Marlborough in during the 1899-1900 season, but moved thereafter to 24 Fenway. 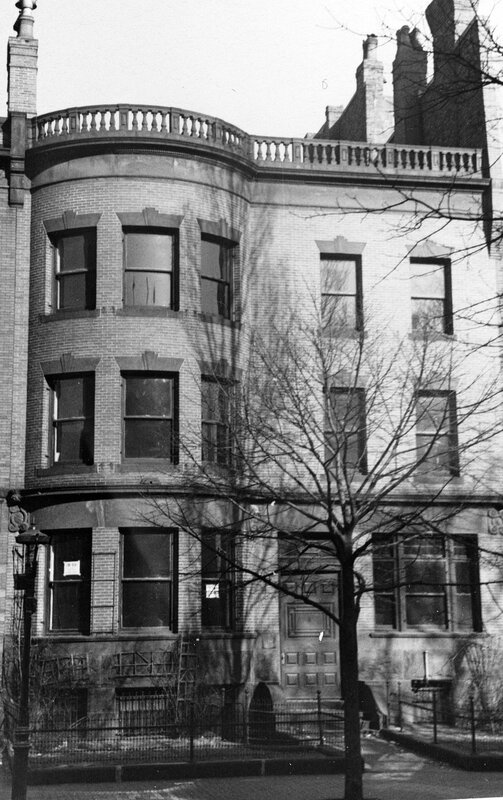 They continued to live at 401 Marlborough during the 1901- 1902 season, joined by Jordan Dumaresq and his wife, Amy (Gunther) Sweet Dumaresq. They had married in July of 1901. By 1902, the Dumaresqs were living in Europe. By the 1903-1904 winter season, 401 Marlborough was the home of Alice W. (Twombly) Jones, the widow of Frank William Jones, who had died in December of 1900. Prior to his death, they had lived at 232 Beacon; she subsequently had lived at The Tuileries at 270 Commonwealth. 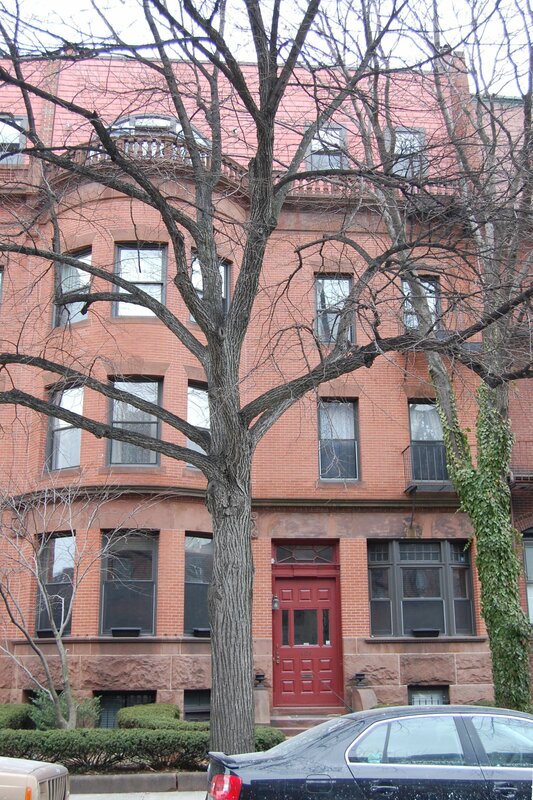 She continued to live at 401 Marlborough until her death in July of 1906. On October 9, 1906, 401 Marlborough was purchased from Daniel Denny’s estate by Dr. Andreas (Andrew) Forest Christian, a physician and physiotherapist. He and his wife, Myrtle Edith (Shaw) Christian, made it their home. They previously had lived in an apartment at 405 Marlborough. On April 2, 1915, Samuel Lebowich foreclosed on a mortgage he held on 401 Marlborough and took possession of the property. On October 11, 1915, he sold the property to John Herrick Powers, an attorney. He lived at 74 Westland. Andreas and Myrtle Christian continued to live at 401 Marlborough. On June 27, 1921, he acquired the property back from John Powers, and on January 18, 1922, he transferred it into his wife’s name. By 1923, he operated a private hospital at 401 Marlborough. On February 11, 1931, the Provident Realty Company foreclosed on the mortgage it held on 401 Marlborough and took possession of the property. It remained the Christians’ home. On February 20, 1931, three people were overcome by coal gas which, according to the Boston Globe, “swept through the 26-room home of Dr. Andreas Christian at 401 Marlborough st.” The three included the Christians’ daughter, Hazel Madeleine Christian, their housekeeper, Miss Anna Hansen, and a nurse, Miss Matilda Peterson. Myrtle Christian had arrived home to discover that they had collapsed, and called for assistance. On November 4, 1931, Dr. Christian was sentenced to one year in jail, having plead guilty to forging the signature of one of his patients and transferring her funds to his account. Myrtle Christian died in November of 1931. On November 18, 1931, the William Hoag and George S. Parker, surviving trustees under the will of Georgiette A. Prescott, foreclosed on a mortgage they held and took possession of the property. Andreas Christian and his daughter, Hazel, continued to live at 401 Marlborough until about 1936, but had moved to 20 Hereford by 1937. 401 Marlborough was shown as vacant in the 1937-1939 City Directories. In 1940 and 1941, 401 Marlborough was the location of the National Association of United Authors, a publishing organization. By 1943, 401 Marlborough was the home of George Emanuel Schloerb and his wife, Edith Dalzell (Eacker) Schloerb. They previously had lived in Weston and before that in Buffalo, where he had been a dry goods merchant. The property continued to be owned by the trustees under Georgiette A. Prescott’s will and, in March of 1943, they filed for (and subsequently received) permission to convert the property from a single-family dwelling into a lodging house. Edith Schloerb was shown as the “occupant” of the house on the application. By 1944, the Schloerbs had been joined by their son and daughter-in-law, Harrison Douglas Schloerb and Jean E. (Lewis) Schloerb. They previously had lived at 30 Bay State Road. He was a manager with the Hotel Touraine. On June 7, 1945, George and Edith Schloerb acquired 401 Marlborough from the Prescott trust. Edith Schloerb died in 1950. In April of 1951, George Schloerb filed for (and subsequently received) permission to convert the property into a two-family dwelling and lodging house. George Schloerb and Harrison and Jean Schloerb continued to live at 401 Marlborough in 1953, but moved thereafter. George Schloerb died in October of 1955 in Needham. On January 22, 1954, 401 Marlborough was purchased from George Schloerb by John J. Ventola, a real estate dealer. Later that year, he married to Charlotte G. (Rohan) Ventola, an attorney. After their marriage, they made 401 Marlborough their home. In May of 1954, John Ventola filed for (and subsequently received) permission to convert the property into a three-family dwelling and lodging house. On August 18, 1959, John Ventola transferred the property into his and his wife’s names. 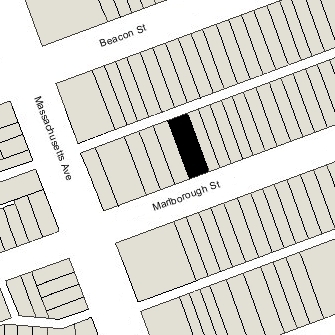 On February 1, 1973, 401 Marlborough was purchased from the Ventolas by John M. Le Coq, trustee of the 403 Marlborough Street Realty Trust. 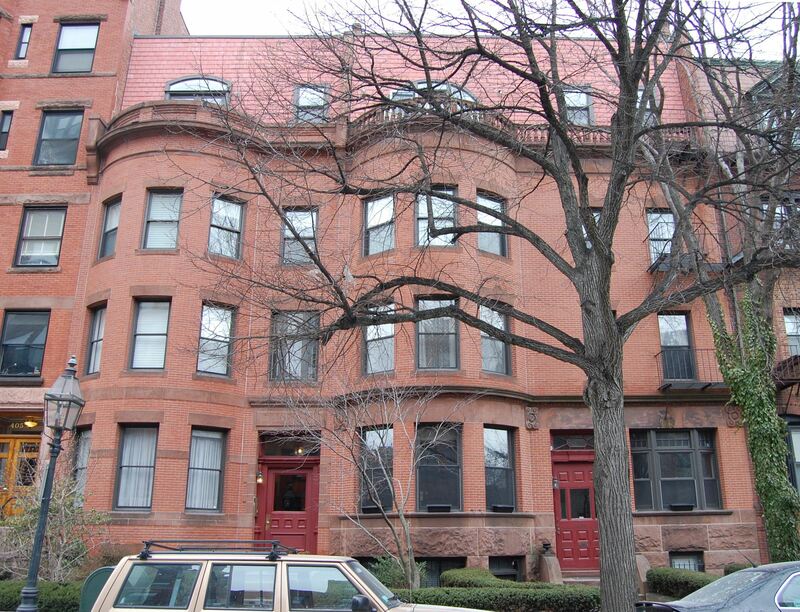 He had acquired 403 Marlborough in February of 1967. On September 16, 1975, 401-403 Marlborough were acquired from John Le Coq by Ruth Elaine Noble and Rita Mae Brown. On July 19, 1979, Ruth Elaine Noble purchased Rita Mae Brown’s interest in the properties. At that time, Rita Mae Brown, a noted author, was a resident of Charlottesville, Virginia.